Hello there! I am Jonie Lim from Malaysia. 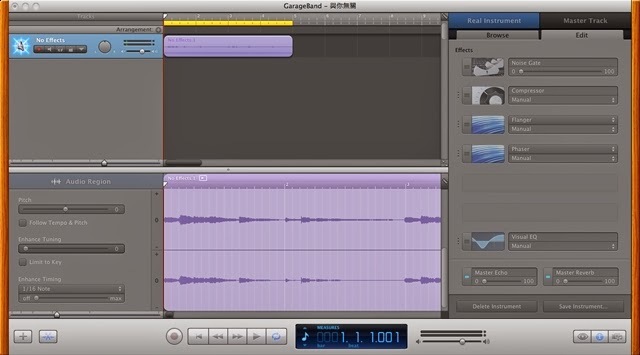 This is the 5th week assignment for Introduction to Music Production on Coursera. 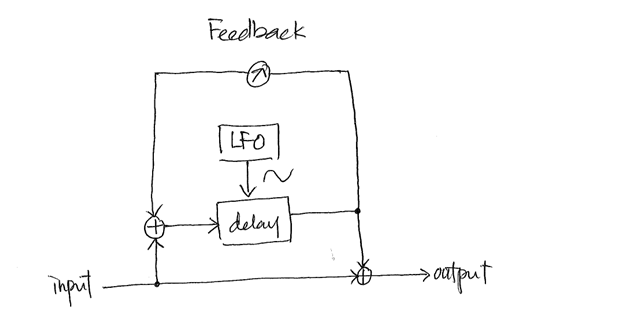 This week topic is very tough for me, I'll try my best to explain how short delay effects, i.e. flanger and phaser function. In order try to show the difference between the flanger and the phaser, I have the parameters set similarly. Note that I have both set to the highest intensity to make sure the effect is significantly audible. Next, I set both speed to 0.5Hz. This is the low frequency used to modulate the signals. The flanger can have the feedback set to be inverted or normally here. Since the phaser cannot have it set inverted, thus I have both of them set to 50%, and the feedback of flanger is set towards normal feedback. Next, let's look at some technical aspects of the 2 audio effects. 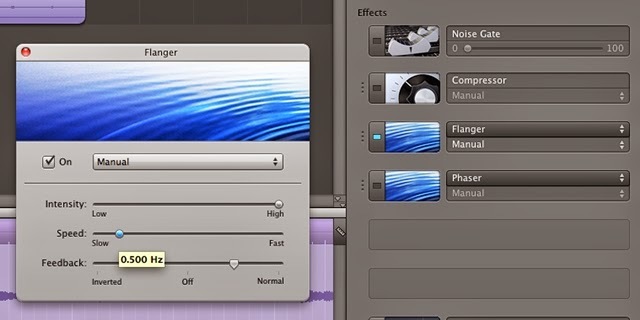 A flanger is an audio effect that mix 2 identical signals together, with one of the signal is slightly delayed, and it gradually changing across time, which is 0.5Hz in the sample here. It is normally controlled by a LFO (low-frequency oscillator). It produces notches like a comb filter if the signal is observed under frequency spectrum. The audio effect sounds more harmony and distributed evenly across time. This is due to the delay is applied to the signal equally. A phaser on the other hand is a special effect depends on the DAW or the gadget maker to set the notches across the frequency spectrum. Most of the time, a phaser have only a few notches across the frequency spectrum. Similarly to flanger, it is also modulated by a LFO so that the position of the notches continuously move across the frequency spectrum. 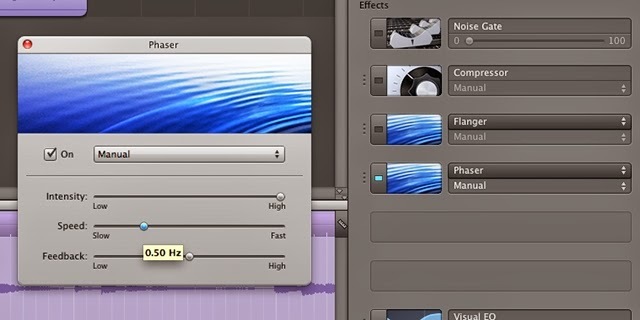 The audio effect of phaser sounds more synthetic and more significant in sweeping between left and right track on the same settings. A phaser is based on a chain of all pass filters, which all of these filters will be modulated by a low frequency delay. 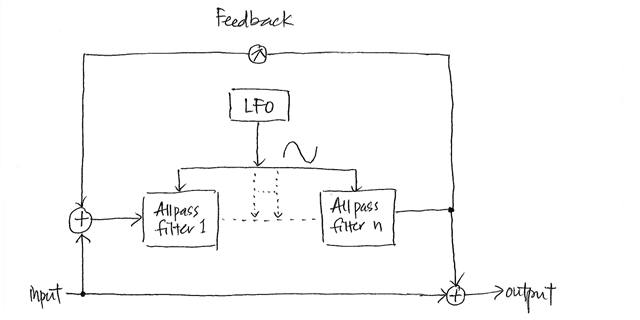 Thus, the output of the phaser block has a non-linear delay mixed with the original signal.